NASA Press Kit for space shuttle mission STS-58. 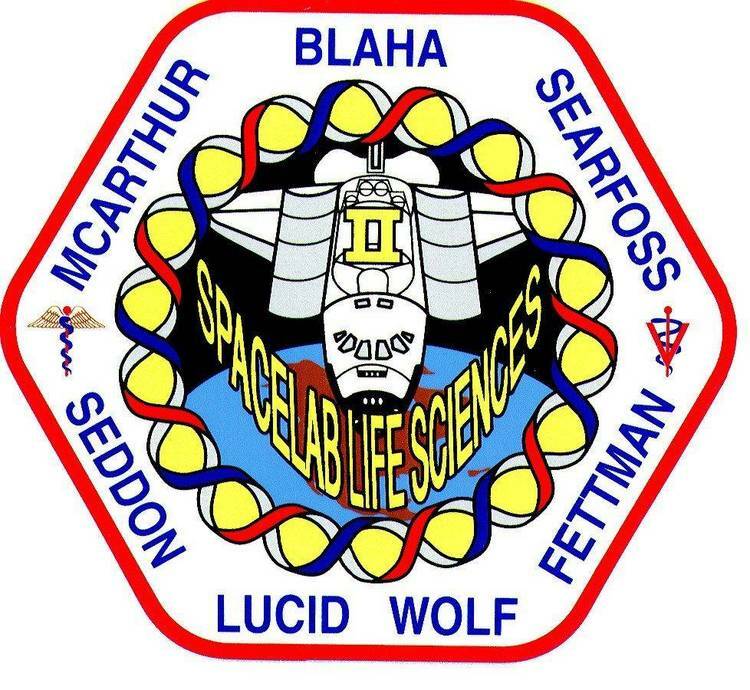 (Launch Oct. ’93) Included is GIF of mission patch. This is a two week life sciences mission. Dryden Flight Facility, Edwards, Calif.
adapts to the weightless environment of space. into medical problems experienced by indiviudals on Earth. environment since the Skylab program in 1973 and 1974. The SLS-2 mission currently is scheduled for launch no earlier than Sept.
at an inclination of 39 degrees to the Equator. Microgravity Payload-2 mission scheduled to fly in February1994. Morocco; Moron, Spain; or Zaragoza, Spain. Air Force Base, Ben Guerir, Moron or Zaragoza. In the past 32 years, Americans have been rocketed into space 87 times. mechanisms responsible for that adaptation remain a mystery. available to science -- the microgravity environment of space. Flight Research Facility, Edwards. Calif.
ground-control and flight animals will be part of post-flight studies. for future applications on Space Station. increases in resting heart rate and decreases in pulse pressure post- flight. system, particularly on respiration, blood flow and gas exchange. fluid shift and the long-term adaptation of the heart and lungs. Principal Investigator: Leon E. Farhi, M.D. amount of blood pumped by the heart with each beat at rest and during exercise. parameters will be measured during the exercise portion of the investigation. Principal Investigator: C. Gunnar Blomqvist, M.D. microgravity-induced changes in the heart's structure and function in space. general opening of blood vessels on orbit. by a venous catheter inserted into the arm of a crew member preflight. measured using a leg cuff device. Principal Investigator: John B. West, M.D., Ph.D.
responsible for this unexpected trend on SLS-2. crew time and resources become available. the renal/endocrine and hematological systems. in the cardiovascular system and in the blood system. blood system initially by a decrease in the plasma volume. understand the mechanisms behind these changes after SLS-2. Principal Investigator: Carolyn Leach, Ph.D.
plasma volume and extracellular fluid. Principal Investigator: Clarence P. Alfrey, M.D. maturation of red blood cells has important implications on Earth. Principal Investigator: Albert Ichiki, Ph.D.
happen on long-term flights and how this change may affect crew performance. the rat during spaceflight are the same as in humans. readjustment to normal Earth gravity. regulatory physiology of red blood cell production in a controlled environment. information about how microgravity affects the blood system. prevent harm to people on Earth with anemia or other blood diseases. Principal Investigator: Clarence Alfrey, M.D. on red blood cell production. stored in the Spacelab freezer for post-flight analysis. preliminary findings of the study. astronauts early in flight probably more than any other physiological changes. sensual cues set to the brain, causing disorientation. effects of space motion sickness. Principal Investigator: Muriel Ross, Ph.D.
sensitive to gravity. Experiment 238 will continue research begun on SLS-1. novel environment by changing the number, type and groups of synapses. may occur within the inner ear in response to the microgravity of space. involvement in disequilibrium, including space motion sickness. based on anatomical, physiological and behavioral findings. on gravity receptors in space. Principal Investigator: Laurence R. Young, Sc.D. the vestibular system in space. perceived direction and velocity of rotation. symptoms on a pocket voice recorder. affected as humans adapt to microgravity. the experiment unfolds in space. muscle protein is broken down into its constituent amino acids. information about this complex system. Principal Investigator: T. Peter Stein, Ph.D.
changes in protein metabolism which lead to a decrease in muscle mass on orbit. a blood protein essential to coagulation. Principal Investigator: Kenneth M. Baldwin, Ph.D.
has shown that exposure to microgravity causes a loss of muscle mass or size. by rodents for standing and walking. population to live more productive lives with greater vitality. Principal Investigator: Danny A. Riley, Ph.D.
potentially risk irreversible loss of muscle strength. stress of launch, microgravity, re-entry and readaptation to Earth's gravity. blood clotting, tissue swelling and increased tissue necrosis. Principal Investigator: Claude D. Arnaud, M.D. Experiment 305, " Pathophysiology of Mineral Loss During Spaceflight,"
calcium excretions and bone mineral loss. role of intestinal calcium handling. then frozen for post-flight analysis. Principal Investigator: Emily R. Morey-Holton, Ph.D.
inhibit bone formation in juvenile rats. urine or feces must come from bone. flight. Bone turnover also will be measured in the crew during this mission. RAHFs will fly on the SLS-2 mission. repair or other inflight operations are performed. mission in 1991 and on the Spacelab-J mission in 1992.
studies have been flown on previous Shuttle missions. Countermeasures." The others will occur before and/or after the mission. Flight Days 3, 8, and 11, followed by a 4-hour soak protocol on Flight Day 14.
will be recorded as will comments from the crew members during the operations. changes in sway and balance. electromyography to determine skeletal muscle strength, endurance and power. surface gravitational acceleration (i.e. 1:109). orbit so that the flight data would fit into its 4 megabyte memory storage. maneuver also will be performed on flight day 2.
orbiter payload bay, near the aft end of the bay. the Shuttle through automated computer-to-computer amateur (packet) radio link. specialist William S. McArthur, Jr. (KC5ACR) and payload specialist Martin J.
in France using "ham radio." include SAREX information in its regular voice and teletype bulletins. Note: The astronauts will not favor any one of the above frequencies. the above frequencies chosen by the astronaut. extended absence from a landing trainer such as the Shuttle Training Aircraft. be demonstrated for the first time. high resolution color display and a hand controller with orbiter look and feel. PILOT with orbiter handling and guidance characteristics. will be making his fourth spaceflight. more than 453 hours in space. Technology on a National Science Foundation Fellowship in 1979.
flying time in 54 different types of aircraft. Murfreesboro, Tenn., and will be making her third spaceflight. 3 years of general surgery residency in Memphis following graduation. N.C., his hometown and will be making his first spaceflight. engineering from the Georgia Institute of Technology in 1983.
assistant professor in the Department of Mechanics at West Point. 2,700 flight hours in 36 different aircraft. hometown and will be making his first spaceflight. development of the American Flight Echocardiograph. has logged over 500 hours in the F4 Phantom jet. Shannon W. Lucid, Ph.D., 50, serves as Mission Specialist 4 (MS4). hometown and will be making her fourth spaceflight. University of Oklahoma in 1963, 1970 and 1973, respectively. over 502 hours in space. Martin J. Fettman, D.V.M., Ph.D., 36, serves as payload specialist. professor of clinical pathology from 1982 to 1986.
was named a Professor of Pathology at Colorado State in 1992.